Remember this photo from earlier this month? It was a “Wordless Wednesday” pick, and under it I wondered how I would feel about these plants in December or the early spring. Well, right now that doesn’t matter because these plants are just fabulous for Thanksgiving table decorations (provided, of course, you didn’t really want to see the folks across the table from you. In some families, that’s all good. 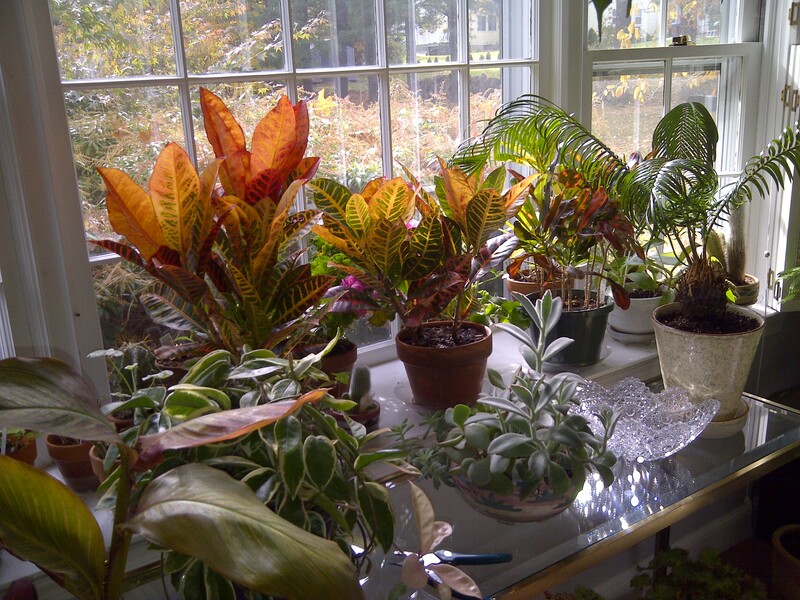 In others, perhaps these plants are better on a sideboard). This time of year, I seesaw between wanting to enjoy the last of the lovely fall colors–because where I live, in New England, fall is the most glorious time of year–and fighting off the urge to begin the “early Christmas” decorating. Of course, if I were going to begin “early” Christmas, I probably would have started over a month ago as the retailers did. But I really am not one of those. As I said a week ago, until it got cold, I couldn’t quite believe it was even November! There also seems to be more willingness to give back at this holiday–more folks seem to volunteer or to put together food baskets than at the other holidays when everyone is so rushed. But whatever the reason, these plants, with their palatte of oranges, golds, and muted greens just speak of the harvest and the bounty of Thanksgiving. This year, the first day of Hanukkah falls on the day before Thanksgiving too, giving many folks a double reason to celebrate! Where ever ever you are, and how ever you celebrate (as our neighbors to the North, in Canada have already done), enjoy what’s left of November! Next Article Wordless Wednesday–Beat the Winter Blues!